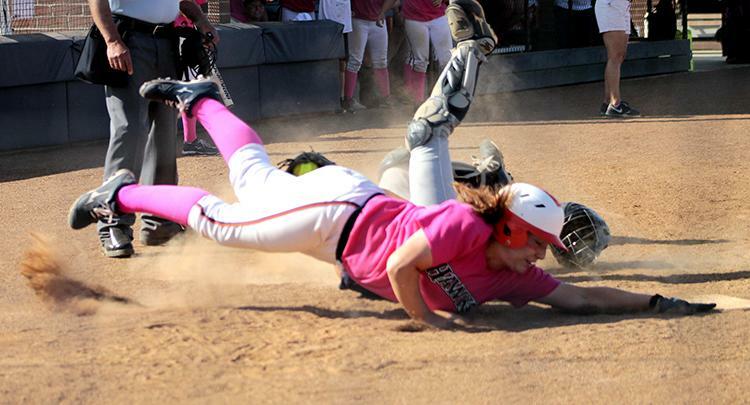 Sophomore outfielder Jessica Venturelli, in her pink uniform for the days breast cancer awareness drive, dives for home base in an attempt to tie the score against the American River College Beavers sophomore catcher Jordyn Bradley on April 19. 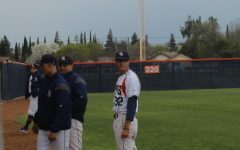 Venturelli was called out, and the Hawks lost the second game of their double header against ARC, 5-4. The Susan G. Koman foundation estimated that in 2014 over 40,000 women and 430 men will die from breast cancer related deaths. 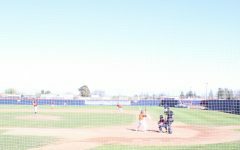 Jeanne Calamar, assistant athletic director at Cosumnes River College, is a three time survivor of breast cancer and is also one of the inspirations for the third annual breast cancer awareness game on April 19. The Hawks donned pink uniforms to support breast cancer awareness, as volunteers sold raffle tickets to fans with every dollar made to be donated to breast cancer research. Much like the battle against cancer, the Hawks battled on the field as they took on the American River Beavers. 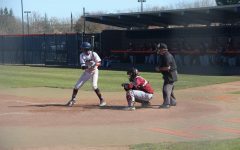 Controversial calls by the umpires, against both teams, became a running concern throughout both games of the double header. A continually growing and shrinking strike zone became the clearest issue, when one moment a pitch would be a ball only for the next pitch at the same exact spot to be considered a strike. 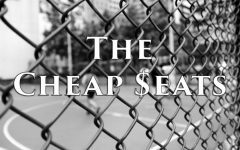 The crowds mood through the two games changed greatly as the umpires would call players out or safe, causing the crowd to erupt in jeers and comments as they readily disagreed. A favorite of which seemed to be asking if the umpire, or blue as the crowd referred to them, was blind. While the Hawks ultimately lost both games, 2-1 for the first and 5-4 in the second, they managed to keep it close both times. 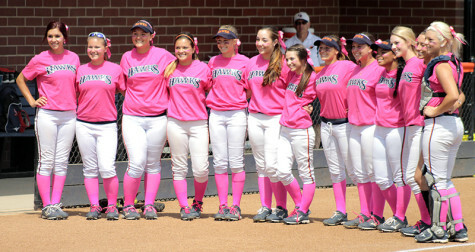 The Hawks softball team poses for a group photo on Breast Cancer Awareness Day before their doubleheader on April 19. In game one both teams came out strong scoring a run in their first inning, only for defense to strengthen up keeping both teams from scoring anything until in the sixth inning the Beavers freshman infielder Ranaya Baugh sent a ball deep into center field bringing freshman infielder Lolli Conway home after the Hawks freshman outfielder Jessika Wilkins dropped the ball. The second game started off with a home run from the Beavers sophomore infielder Shirley May setting the tone for an uphill battle for the Hawks. In the third inning the Hawks tied the score at 1 after Wilkins managed to steal second, advance to third after a sacrifice bunt from sophomore infielder Amy Pedretti and then came home after the Beavers sophomore catcher Jordyn Bradley dropped a pitch. 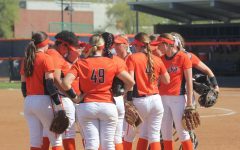 Much like the first game it would be the sixth inning that changed everything, as the tie of one run each was broken as with two outs on the board, the Beavers managed to rally back and score four runs before the Hawks ended the inning by catching freshman third baseman Brittni Hodge stealing second. 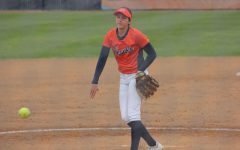 “We could have played better defense in this game, we had way too many errors that kept runners on or gave them a couple extra bases so that was tough, but I liked the way they fought at the end,” Schroeder said. 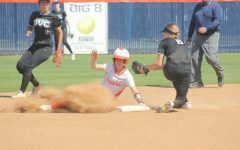 That would be the last time the Beavers scored any runs, and it seemed that there would be none for the Hawks either but the seventh inning changed the game once more. With all on the line, the Hawks came out and loaded the bases leading three runs of their own bringing their score to four, with a possible tying run ready to bring the game into extra innings. It would be sophomore outfielder Jessica Venturelli that tried to bring the tie as she ran home in a race against the ball as the Beavers tried to get it to the catcher. Unfortunately the tie was not to come as Venturelli ran into Bradley before home plate, after the Beavers catcher had the ball, and the umpire called an out much to the anger and disappointment of the crowd as they erupted. Much of the game rode on the shoulders of both teams pitchers as Horbasch and the Beavers sophomore pitcher Stephanie Mitoma pitched for the entire fourteen innings of play. 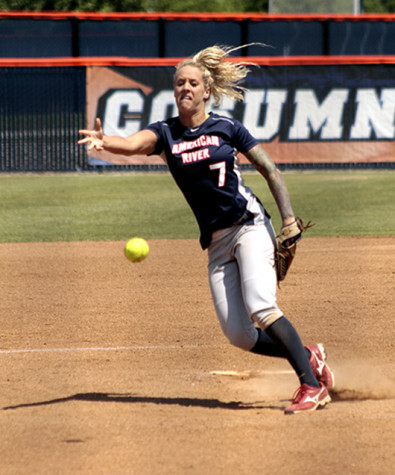 American River College sophomore pitcher Stephanie Mitoma throws the ball towards home plate on April 19. Mitoma recorded two complete games on the day. Amidst the controversy of the officiating and the battle on the field, the breast cancer awareness game managed to bring in $143, said 26-year-old history major Heather Martin who was one of the volunteers. Martin said that $70 came from the raffle and $73 was donations, with winners of the raffle getting to choose from items like t-shirts with the CRC logo or headbands.